‘A Question of Leadership’ is co-hosted by Curious Minds and DIY Theatre – join us to challenge perceptions of leadership. 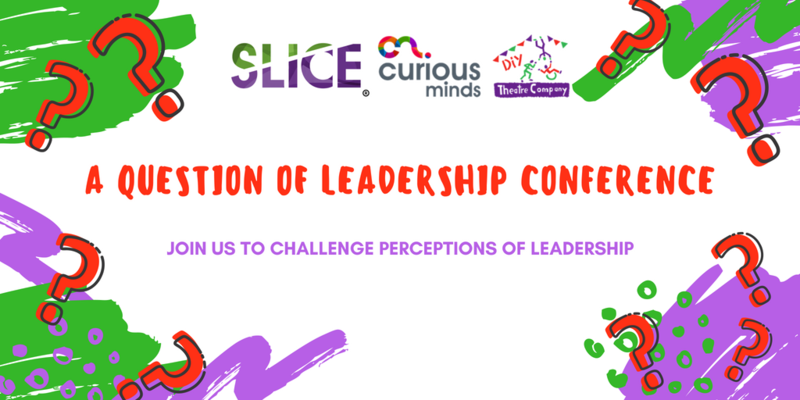 The conference will will bring together teachers, cultural organisations, artists, performers and academics to exchange experiences of inclusive leadership and of research across the education and arts sectors and to question notions of leadership and research within these sectors. The focus will be on inclusive practice with a particular focus on disability. The conference will begin with ‘Introductions & Provocations’ with DIY’s patron Jenny Sealey MBE, Director of Graeae Theatre Company, Karen Flood, Director of First Step and a film made by DIY’s Friday Group. Presenters and workshop leaders are from Mind the Gap, Creative Minds, Liverpool Hope University, Open Theatre, DIY Theatre, University of Chester, Blue Room at Bluecoat, Dada Fest and a number of SLiCE fellows (Specialist Leaders in Cultural Education) based in a range of schools across the North West. ‘A Question of Leadership’ conference offers participants a variety of presentations and workshops under the headings of ‘Cultural Education and Inclusion’, ‘Research’ and ‘Leadership’. Some will be practical sessions others more formal presentations – participants will be able to choose which sessions they wish to attend. Mind the Gap will share their experiences of collaborating with an academic researcher – looking at parenthood and people with learning disabilities. Six presentations by practicing SLICE fellows on a range of perspectives on inclusive education in school settings. DIY Theatre Company will be presenting the research we have recently been involved in: Defining Moments: Leadership and Learning Disability Theatres. This research was undertaken as part of Sue’s Professional Doctorate in Applied Theatre at University of Manchester. It offers a critical and relational perspective on leadership within Learning Disability Theatres – where leadership is less about the qualities and features of individual “heroic” leaders and far more about the social interactions and relationships amongst people who make leadership. The day promises to be one where we can all learn from and inspire each other.